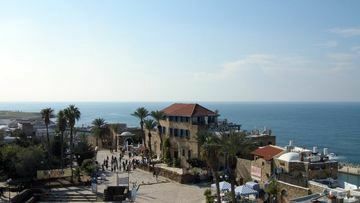 A brother of Taizé recently spent a fortnight in the Holy Land and Lebanon (from November 21st to December 6th). Here is an account of his journey. Arrival in the middle of the night and a few hours’ sleep in a welcoming Franciscan community at Jaffa, a few yards from where the apostle Peter had his vision (see Acts 10:9-16) whilst he was lodging with Simon the tanner. It was there that the Church began to grasp its call to universality. It’s not difficult to imagine Peter on one of these terraces looking at the sea which calls to a wide and universal vision. A journey, the same day, towards Nazareth. A most warm welcome by a family from Nazareth. Over the years, the whole family has passed through Taizé: the father (now deceased), the mother, the three brothers, and the sister and her children. That same evening thirty of us came together for a prayer with the songs of Taizé at the Little Brothers of Jesus. This was where Blessed Charles de Foucauld lived for a year. This prayer was part of a monthly series. The following day we met again, for a bible sharing on the first Beatitude: “Happy are the poor in heart, for theirs is the Kingdom of Heaven”. At Nain, 15 minutes away from Nazareth. I wanted to see this place where St Luke, in chapter 7, showed Christ’s compassion for human suffering. We find a closed church, with detritus everywhere in the church courtyard, and some suspicious smells. Suddenly a bus arrives and forty Chinese people get off it. The group’s guide reads the text from Luke about Jesus at Nain, giving a short commentary on the text. When she has finished, I feel the urge to greet her. When I tell her I am from Taizé, her eyes open wide. She knows several brothers and several people in her group have visited us. At her request I say a few words about Nain; then I ask if we can sing a song of Taizé. I start “Bless the Lord” and am greatly surprised to hear the song taken up by the whole group. All forty Chinese, without exception, sing this same song heartily, but in Chinese. A beautiful moment. At Jerusalem, a lovely welcome in a Hebrew speaking Catholic community, situated in Rav Cook Street, five minutes from the Old City. 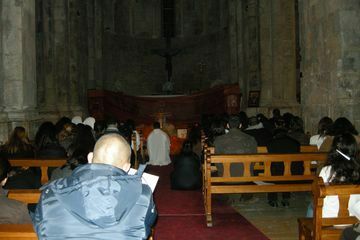 Here they try to live an inculturated Christianity, and they spare no effort to express themselves and pray in Hebrew. A prayer with songs of Taizé takes place in the chapel of this community every fortnight. This is what is happening this evening. Amongst those taking part there is a rabbi and some young Jews who are good friends. I recognise Reut who has brought her fiance.. It’s the first time he has been to a Christian gathering. I shall meet them again a few days later in the synagogue of the same rabbi, for a prayer followed by a Sabbath meal. The next day, after a Mass at Ein Karem (the site of the Visitation) and a beautiful sharing with the Sisters of Sion, I am back in Jerusalem, two steps away from the Holy Sepulchre, for a prayer with the songs of Taizé in a Lutheran church. Numerous young people have come to take part, notably young Germans who are volunteering in Israel. There is also the Father Abbot of Abu Gosh, and the Prioress Mother Ignatius. Also very touching to see the Armenian Archbishop appear, accompanied by a priest who sings the Beatitudes admirably in his language. Protestants, Orthodox and Catholics are together quite naturally. It is the Rector of the Lutheran church who has prepared this prayer so well. Little yellow notices were visible all over the Old City announcing our prayer. Candles placed straight onto the ground form a cross. We expect there to be about fifty people, but over a hundred come, which does not match the Rector’s provisions for the meal. He asks me what we shall do if we are more numerous? I answer him: “We shall laugh and share.” And that is what happens. And there is some left over! Return to Jerusalem and a visit to the Armenian cathedral in the company of Archbishop Arvis Shirvanian who has invited me to a time of prayer with the forty Armenian seminarians training in Jerusalem. It is moving to hear the Archbishop talk about Saint James, first bishop of Jerusalem, whose relics are venerated in this place. There are no pews in the church, but large carpets are spread out on the ground, framed by four pillars. In the past, the Armenians had a great number of monasteries in Jerusalem. In Bethlehem again for a meeting which had been arranged with young Palestinians at the Emmanuel Monastery where about a dozen Benedictine sisters live. Three of them, including the Abbess, are young. With the young Palestinians – some have been to Taizé – we learn some songs of Taizé in Arabic, then we form three small groups for a sharing based on this phrase of brother Roger: “If a trusting heart were at the start of everything…” Our meeting ends with a prayer which is beautiful. Some young Lutherans from Beit Jala, who were at Taizé last year, have come for this meeting. We find it hard to leave each other. The next day, I am at the University of Bethlehem. A lovely exchange with the chaplains. The plan is forming for a group of young Palestinians to travel to Taizé. Sister Patricia, a Maltese who has been in Palestine for 25 years, has already taken other groups to Taizé. She mentions the immense disappointment of these young people on arriving in our village of Taizé where there are neither shops nor restaurants; then the progressive discovery of another joy: that which is born of common prayer and talking with other people. 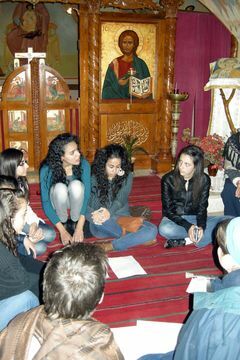 We also speak of a possible meeting for young people, even if just a modest one, in the Bethlehem region. Some people remember Brother Roger’s visit in 1982. This is the case for Father Toufiq who is now responsible for the youth ministry of the Maronite Patriarchy. With him and some other people, notably the newly elected Secretary General of the Council of Churches of the Middle East, we talk about a group of Lebanese, from several denominations, that could go to Taizé in 2012. A half day at Notre Dame University in Beirut this morning. Father Boulos, a Greek Orthodox priest, invites me to speak at his course about monotheism. This consists of talking about Christianity by speaking of the experience of Taizé, for about an hour, to Christian and Muslim students. The students prove to be very attentive, and a good discussion follows from their questions. Ziad, who came to Taizé a lot during his studies in France, is a professor at this same university and Vice Dean of students. He has arranged a meeting at midday for all who wish to come to a prayer and discussion with a Taizé brother. I am expecting a really small group, but lo and behold the big room where our meeting is to be held is full of young people. There are around 120 of them. Once again, Christians and Muslims are together. We watch the DVD “Life at Taizé” which I complete with a few explanations, then another beautiful sharing with the students. A visit to the Adyan Association, founded in 2008 by Father Fadi Daou and Nayla Tabarra: Adyan. The word ‘trust’ occurs frequently in their documentation. They too want to build trust between religions, between cultures, between peoples. They have understood the primordial role of education in this domain and produce various tools in this direction. Lovely meeting with Nayla Tabarra. A Muslim, she has lived for three days with our brothers in Bangladesh and talks warmly about this. One can be confident in the future of Lebanon when one meets people of this quality and when one discovers their initiatives.